Easy Photo Editing Software. Edit pictures easily and quickly with a host of Photo Effects. 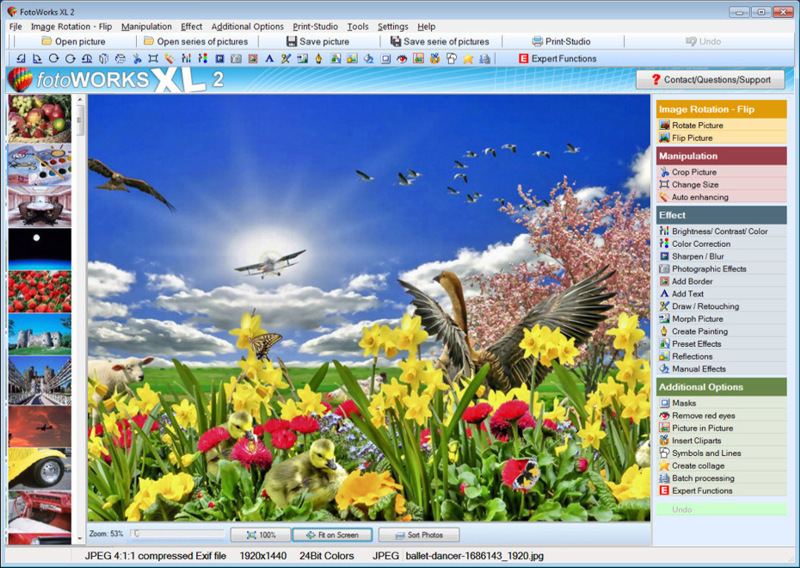 This high-quality Photo Editor Fotoworks XL will help you edit your photos and other images by offering a huge variety of useful functions and effects. This Image Editing Software Fotoworks XL can aids your photo enhancing with functions such as morphing, clone stamp, cropping and many more. The program even features auto-enhancing and batch picture processing. Don’t waste time and money on expensive Photo Editing Software that is difficult to use. This Photo Editing Software is very easy to use and suitable for beginners, photographers, as well as seniors and children. Get the Photo Editing Software Free Download that meets the highest quality standards, and includes a complete Image Editing Package. The Photo Editor has all known functions needed to edit, enhance, or improve photos; create collages, manipulate or retouch images, or create a stunning photo montage.